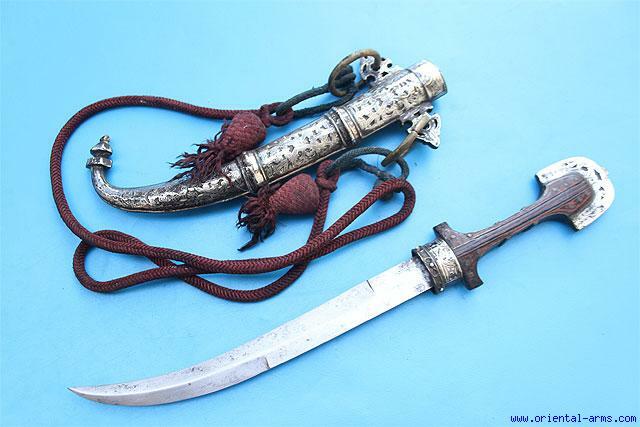 The Moroccan version of the Arab Jambiya dagger is locally called Koumaya and characterized by a slender blade, usually dual edged at its lower half and single edge at the top. There is a big variety in the decoration styles and quality of the handles and scabbards. This one is a fine example, circa 1900, of a good quality, 10 inches blade very finely forged and etched with a floral design panel and an image of a rider on the base. Wood handle painted with red strips. Bbrass scabbard with finely Pierced silver front cover and enameled and nielloed collar and scabbard mouth. Big decorative carrying rings. Total length 17 inches. This Koumaya comes with its original baldric carrying cotton rope. Very good condition.